Medical Communications, publisher of the peer reviewed clinical journals Medicine Today, Cardiology Today, Endocrinology Today and Pain Management Today is pleased to announce that the 2015 annual syndicated readership survey results for its flagship journal, Medicine Today, remain strong and stable in the face of falling results for some industry titles. Medicine Today’s average issue readership remains strong at 64.3%, off the back of a 3-point increase in the previous year, bringing the AIR in line with that of AFP. Despite differences in publication frequency, the two peer reviewed GP clinical journals are delivering a combined reach comparable to the newspapers with 77.2% for a two journal buy versus 77.3% for a two newspaper buy. The stability of the AIR results for the clinical journals reflects the evidence that doctors in general practice still strongly prefer their clinical education information delivered in a printed form, with their reading habits largely unchanged by digital alternatives. 67% of high prescribing GPs read Medicine Today within the publication period. The survey allows segmentation of results by low, medium and high prescribing habits. The 2015 sample population records 42.6% low prescribers, 45.3% medium prescribers and 12.0% high prescribers. In fact the low and medium prescribers represent the bulk of the GP population at 87.9% and account for the majority of scripts written. Only 12% of GPs are high prescribers writing 41 or more scripts per day. 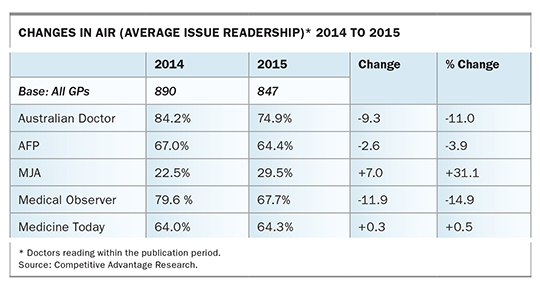 Media selection should therefore take total average issue readership scores into account. Peer reviewed clinical journals delivered in print formats remain a key source of information for GPs. In keeping with proven GP reading preferences, Medicine Today Publications continues to launch more print titles. In 2016, we will branch into specific Respiratory and Paediatric categories, delivering advertisers more very valuable opportunities to connect with their target GPs in credible clinical environments.